The sort you wouldn’t mind your friends staging for you. The first usage of the term “webcomic” predates Google by three years, Wikipedia by six years, and YouTube by ten. Over the last fifteen years, it’s gone from novelty to Internet subculture, launching small businesses, charities, and TV series. A webcomic even made Time magazine’s list of Top Ten Graphic Novels in 2007. So with this vast and impressive history building up over the years, why isn’t there more by way of webcomic-centric conventions? Well, there will be soon. September 10 sees the beginning of Intervention, a convention devoted entirely to webcomics and other Internet-based content. Self-described as “one part new media, one part gaming, one part nerd party,” Intervention is already boasting a massive guest list, full of big webcomic names like Pete Abrams, David Willis, and Bill Holbrook. Attendees will get the chance to meet and interact with these creators and more, as well as picking up their wares in what promises to be a rather classy Artists’ Alley. How classy? Well, for one thing, there’s free access to a locked storage room during off hours, so artists don’t have to lug the contents of their table around or trust in the good nature of other congoers. If you’re a regular in the Alleys, you know exactly how fantastic this is. Headed up by Onezumi Hartstein and James Harknell, both webcomickers themselves, Intervention is tailor-made for both fans and creators. Multiple programming tracks are already in the planning stages, covering webcomics, web management, marketing, art, and parties. What? Parties? Oh, yes. New York’s DJ Subvert will be hosting two interactive dance parties — one where attendants can help him create music, and another featuring dry-erase walls for dancers to play on. Expect movies, bands, game shows, and an exhibition by Super Art Fight. If it sounds ambitious, that’s because it is. Myself, I’ve been on the convention circuit for going on eleven years and been a webcomicker for nine, and I’ve never seen anything like it. The level of interaction and the promise of a party atmosphere sounds at once awesome and daunting. But the vibe behind the pre-con hype and advertising is a positive one. If there’s stress behind the planning (and there is, because it’s a convention), it’s not pervasive or infectious. There’s a mix of levelheadedness and exuberance about it that’s unheard of for a first-year con. This can only end well — and I’m not saying that with my usual tinge of sarcasm. 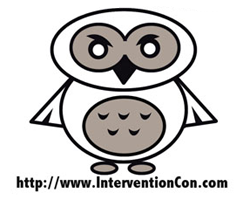 Preregistration and hotel rooms are already open for booking at the Intervention website, and both are being jumped on with all the gusto you’d expect. This, ladies and girls, should be fun. Thanks for the post! :D Also, here is some breaking news – We'll also be teaching ComicPress and CSS workshops at the con with ComicPress devs there to help everyone get their sites up and running. Ooh, this sounds really rather awesome.